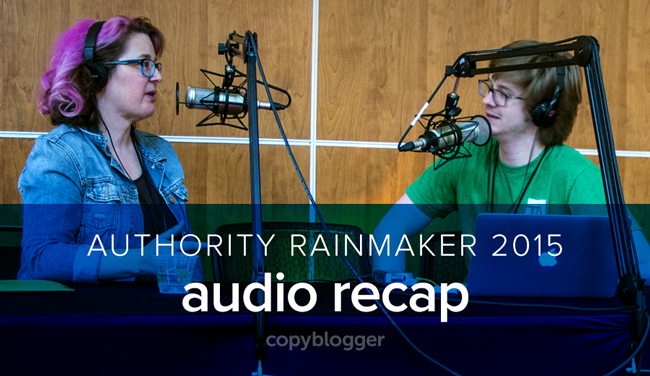 Authority Rainmaker 2015 wrapped up a week ago, and those of us who were there are still processing the online marketing insights we had at the live event in Denver. If you didn’t make it this year — and even if you did — we’d like to invite you to experience some of the energy at the conference. There were so many smart people — attendees, presenters, and sponsors — gathered in one place. The collective energy of the group could be felt in the opera house seats, in the lobby, at the meals, and at the parties. Listen below to Clark Buckner of TechnologyAdvice interview Authority Rainmaker 2015 presenters, attendees, and sponsors. Hear their favorite takeaways below. And read on for the most compelling quotes we heard. I think that there’s a lot of revenue to be made — and a lot of business to be made — by helping add value to the people you most want to help and serve. If the crowd is going that direction … I go the opposite direction. We’re looking for this belief-based tribe to belong to … there is a big part of our brain that wants that. It’s not “tell your story and people will come,” because that’s not true. But tell your story, and with the right amplification the right customers or audience will find you and identify with you. Our most important marketing assets are our employees. If we don’t have a communication program ready to go for our employees, it’s going to be tough … you’ve got fertile land right there ready to go, but you have to make sure you water it a little bit. If [the site visitor owns] product X, then promote product Y, don’t keep promoting product X to customers of product X.
It’s about … putting the right piece of content in front of the right person at the right time to … get them on the process to buy. The thing I heard from a lot of people was just … be honest, be true. Perfection never comes. I’ve struggled with that myself for years — “Well, I have to do this exactly perfect.” No, you just need to get started. Let’s grow this together. … here’s what it is, but there’s this big, long journey we can go on together. We wanted to look from episode one that we were at the top of the game … I’d rather have no sponsor than to compromise with the values of the show and get any sponsor. They are doing things that really make me think, and it’s stuff that’s really actionable, and it’s not just the same old stuff over and over again … I come out of this conference in particular with pages and pages of practical notes of stuff that I can use in my business. Empathy is an asset … empathy for your customers and for their needs, and hopes, fears, and dreams is really invaluable … is really important. For us, it’s more of an empowerment education-type thing, rather than being the ones who bring them the content … the goal as a consultant is to be there when they need you, but they really need to be able to do this stuff themselves as well — it’s the only way they’re going to be able to grow. No matter the angle or the topic, there are all these themes that come through … treating leads as humans, thinking empathetically about other people … intense awareness of, empathy for, focus on delivering to the audience … that the people on the email list need to be treated as people you serve. Many thanks to Ethan Beute for today’s post image.